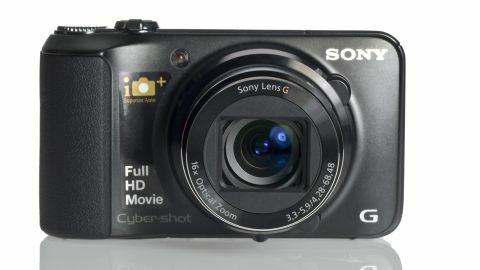 The Sony Cyber-Shot DSC-HX10V features very similar specifications as the Sony HX20V, but comes with a shorter zoom range, at a still impressive 16x optical zoom. Housing an 18.2 million pixel 1/2.3 inch CMOS sensor, the camera also features the latest Bionz processor, Full HD video recording, inbuilt GPS and full manual control. The 16x optical zoom lens is equivalent to 24-400mm in 35mm equivalent terms, and is also boosted to double that by Sony's Clear Zoom technology. Working in the same way as digital zoom, Sony claims that its By Pixel Resolution Technology is of a higher quality than standard digital zooms. On the back of the camera is a 3-inch, 921k dot XtraFine TruBlack TFT LCD screen. There's no viewfinder, and no port or hotshoe to incorporate one either. Unlike the premium Sony RX100, the Sony HX10V doesn't have the ability to shoot in raw format. It does come with a number of other advanced controls, though, such as Program and Manual mode. Other interesting features, probably designed to attract holidaymakers, are a number of Picture Effects, or digital filters, sweep panorama, 3D shooting and intelligent Auto modes. There's also an impressive sensitivity range, starting at ISO 100 and rising all the way up to ISO 12800. The Sony HX10V has a full price of £299 in the UK and $329.99 in the US, putting it in the same price bracket and category as the popular Panasonic TZ25, which also features a 16x optical zoom.